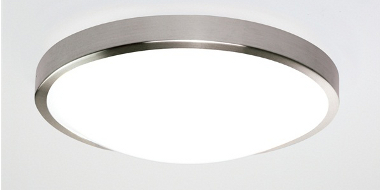 The flush ceiling lights on offer at Sparks Direct are directly mounted onto the ceiling within your domestic or commercial environment. Flush fittings are ideal in properties with low ceilings, as it is fitted tight to the ceiling surface. At Sparks Direct we have a vast range flush mounted fittings, helping you to find the ideal lighting solution for your home or office. Take a browse through our online store to find the correct flush fittings for your property. In older buildings, you will normally find rooms with lower built ceilings. If this is the case with you, then you need flush ceiling lights properly fitted to allow you to easily manoeuvre through your home. The flush fittings on offer at Sparks Direct help to increase the height of your room whilst emitting a warm and cosy feel to all rooms in your household. Most of the flush fittings at Sparks Electrical are energy saving, and many of them can also be used in the bathroom. Select your desired flush light fitting from our wide range below, and then feel free to compare two or more flush lights among themselves to see which one of them would better suit your need, according to their technical specifications. Finally, these lights do not need you to cut out the ceiling; instead, they need to be simply mounted onto the ceiling, making them ideal for new builds and for replacing an older light fitting with something more modern. You can browse through our large selection of flush lights below and, if there is anything you want to ask us about a particular fitting, do not hesitate to "Ask a Question” and one of our lighting specialists will do our best to respond to your query within 24 hours.